Everyone has a place in Arizona. Have you found yours yet? If not, I'm here to help. From the Mountains of Flagstaff to the Valley of the Sun, my team and I help you know the place you call home. I also coach other real estate agents on their marketing systems and tools. And - believe it or not - I actually have a personal life outside of real estate! So this blog is a combination of real estate information, marketing tips, and personal musings. It's my place. Welcome! This house is adorable and waiting for you to call home! Walk inside to a large living room with vaulted ceilings. Continue through the house to discover the open family room and eat-in kitchen. Living areas have engineered wood flooring and warm inviting paint colors. Kitchen has brand new stainless steel appliances and kitchen island with breakfast bar. In the master suite, you'll enjoy the oversized area large enough for a sitting area. Dual sinks, shower/tub combo, and water closet in the master bathroom. Plenty of storage in the linen closet and large walk-in closet with lots of shelf space to keep you organized! 3 additional bedrooms are all generous in size. New roof in 2010. All of this just 1 block away from all the community amenities. Make this house your home today! Located on the outer edge of Pinnacle Pines this townhome has it all, 2 master suits, beautiful great room plus a huge loft which could be used as a study, home office or even converted to 3rd bedroom. Backyard has been finished with open fencing to enjoy your forest view and a gate to access all the trails. Currently being used as a VRBO so it would be a perfect 2nd or investment property that's already producing income! Wonderful golf course lot in Flagstaff Ranch is ready for you to build your ideal home and enjoy! Located on the 1st Green of Flagstaff Ranch's golf course designed by Jerry Pate. This lot is pie shaped, on the golf course, and only borders one neighbor. Gorgeous views will be yours, as well as privacy. Enjoy all that Flagstaff Ranch has to offer - Club house, billiards, pool, tennis courts, community center, fitness center, restaurant, and so much more! Buyer to purchase equity Golf Membership not included in price. Wonderful home located in the highly sought after Cheshire Neighborhood. Original owners have lightly used this home since built. Downstairs you'll enjoy a large living/dining room combination. The kitchen is large and open to family room or extended dining with wood burning fireplace. Upstairs enjoy an oversized master suite with separate shower and tub, walk in closet, dual sinks and gas fireplace. Also upstairs you'll find 2 additional bedrooms, full bath, and large loft overlooking living/dining room below. Enjoy the views of the San Francisco Peaks on this large cul-de-sac corner lot. RV gate access plus covered deck give you ideal ways to enjoy the beautiful Flagstaff outdoors. This home is super clean and move in ready. Put your own touches on it and call it home! This log cabin in Northern Arizona is a dream come true for anyone looking for all modern conveniences in a rural getaway. Gorgeous panoramic views from every room allows you to enjoy nature's beauty. One bedroom on main level and one oversized bedroom upstairs, plus a bonus room and loft where you could accommodate additional sleeping arrangements. Modern kitchen with walk in pantry, stainless steel appliances, granite counters and tile backsplash. Everything about this cabin is welcoming and cozy. Off grid living includes a modern upgraded solar system plus generator, 5,000 gallon cistern, newer alternative septic system, satellite dish, and propane. Close to the Grand Canyon, National Parks, and Bearizona and downtown Williams. Owner will consider carrying financing. This is the quaint mountain cabin you have been looking for, with large deck for sitting out and enjoying the smell of ponderosa pines! 2 bedrooms and plenty of living space, warm up by the woodburning stove after hiking in the forest near by. Located on a quiet cul-de-sac. This townhouse has it all, 2 master suits, beautiful great room plus huge loft which could be used as a study, home office or even converted to 3rd bedroom. Backyard has been finished with open fencing to enjoy your forest view and a gate to access all the trails. Newly renovated end unit in Boulder Point's Enclave, this unit is ready for you to call home! All new wood laminate flooring throughout living areas on the main level welcome you inside. Soaring vaulted ceilings with skylights combined with the new interior paint make this home light and bright. Master suite is located on the main level with no other rooms above it, allowing for quiet privacy. Kitchen has all new stainless steel appliances (Oven/range, microwave, and dishwasher) as well as new sink and fixture, all in a well-appointed layout. Half-bath and laundry complete the first floor. Upstairs, 2 full bedrooms and full bathroom all open up to open view of great room below. New carpet in all 3 bedrooms. AC prewire with sub panel. Private lot with no homes directly behind. Welcome Home! 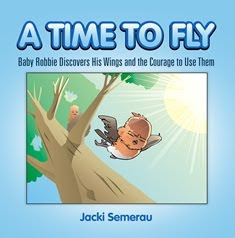 A Time to Fly by Jacki Semerau - A children's book about discovering your talents and gifts. The best tool for cultivating and enhancing business and personal relationships. Period.